The new colors in the Beats Studio 3 Skyline Wireless headphone line are Crystal Blue, Desert Sand, and Midnight Black. 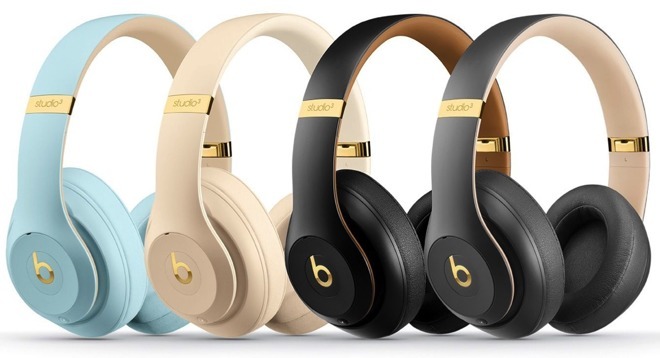 All have the same specifications as the regular line, but now have gold accents including the beats logo, and the headphone band. The line still contains Apple's W1 chip for Bluetooth connectivity and easy pairing with the iPhone. Pure ANC provides ambient noise reduction, and Apple claims the Studio 3 headphone line has up to 40 hours of battery life without Pure ANC, and 22 hours of life with the feature on. Should you not want to use Bluetooth connectivity, there's a bundled 3.5-millimeter stereo cable with an inline remote. The Beats Studio 3 Skyline price remains unchanged at $349. Apple authorized reseller B&H Photo is currently accepting preorders for the new Beats Skyline headphones with free expedited shipping within the contiguous U.S.